It’s actually, just one leopard leaping, but the plural sounds more fetching. Leopards and hyenas are mortal enemies. Both are predators and are high in the food chain. But in the event of an encounter, the leopard will run and can usually outrun the hyenas. Hyenas travel and hunt in packs and that is the true danger to the leopard. A pack of hyenas can corner and kill a leopard. The leopard is a solitary hunter, making it vulnerable when it encounters hyenas. But the one thing the leopard can do that hyenas cannot do – is climb a tree! We were riding in our safari vehicles in the Masai Mara Game Preserve in Kenya, photographing the extensive wildlife there when we received the news was over the radio – leopard alert! Our driver Ben did a u-turn and headed across the savannah at body-bouncing speed to converge on the leopard location (how they know where to drive is beyond me – there are no signs, no maps, no GPS and the few visible roads are dirt and rutted). And suddenly there it was before us. This beautiful cat creature was marching across the flat and open terrain with its tail curled high in the air, head and eyes straight ahead, ignoring the 7 safari vehicles crowding around it. Ben leap-frogged the crowd and positioned the vehicle 100 yards ahead of the cat. It was heading straight for us! As it approached, it did not change direction. It just walked past like we did not exist. So close, so exciting, my heart was racing. 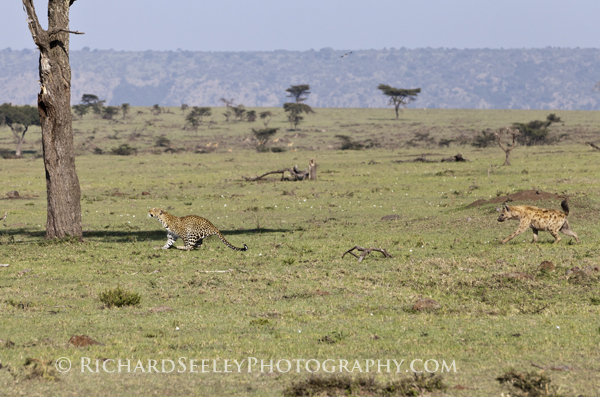 Ben did another leap-frog and repositioned our vehicle so that we had a good broadside view as our leopard marched by. But this time the seemingly steady cadence was interrupted. The leopard stopped, turned its head, and stared as two hyenas came out of nowhere on a diagonal converging collision course. The leopard rocketed into full flight, gaining a slim lead away from the hyenas, and leaped up a nearby tree. In one jump it seemed to land halfway up the trunk of the tree. It then scrambled up the trunk like a launching missile landing 0n the nearest branch. It stood in the crotch of the branch, hackles up, teeth barred as it surveyed the threats from its high perch. The hyenas eventually lost interest and moved on to track other prey. When the hyenas were no longer a threat, the leopard descended the tree and continued its solitary march to its destination. ~ by richardseeley on December 6, 2011. Nice photos. Nice posts. Hope people will be able to read about your blogs so that they can appreciate animals and will learn to love them. “so close” Quel animal majestueux !!! !